What do you do when you have goals and you reach them? Do you make new goals for yourself or do you stay content with where you are? But aren’t there limits and if so how do we know how far to go or when enough is enough. Some people are content with where they are in life and others are constantly trying to keep up with everyone and even try to become number 1. I myself have set goals constantly especially when it came to running. At first I told myself that I would run a 5k race and then I told myself I would run a 15k, then a half marathon. But do I stop here or do I train to run a full marathon. I wonder if I would set to do a triathlon after I complete my full marathon. Sounds like alot huh. How much is enough?? Knowing your limits and challenging yourself are two different things in my opinion. I know that I can only do so many reps of deadlifts at a certain weight and If I tried to do more I could possibly hurt myself. I know my limits. Setting challenges for yourself is training for a 5k, 15k, half marathon and so forth or setting to lose 1-2 pounds a week. Everyone is different and we should not try and live our lives or workout a certain way because someone else is. Do what works for you and listen to your body. I know so many athletes who injure themselves because they try and keep up with the next person. Make small goals in order to get to the big goal! We all have limits but setting realistic goals for yourself will help you stay injury free and keep you healthy mentally. We all have to run our own race and no one else can do it for us. Work hard, eat good, sleep well helps to make a stronger you. Are limits a good thing or bad thing? Respond back with your take on this topic. Interesting. For me, it’s all about balance. I totally agree with what you said about knowing your limits and challenging yourself. The additional element in my life is I always have to ask the question, “Will taking on this new challenge upset the balance of life in my house?” As a husband, a parent and the major breadwinner in our house, there are limits to how much time I can commit to the pursuit of fitness. If that pursuit interferes in terms of time away from my kids, or my wife, then the reward doesn’t justify the effort. Great post. One way that we can gauge if we’re pushing our limits too hard is by our happiness level. Obviously, I don’t think that we should be happy with mediocrity. We should be happy with our best effort. Even if our best effort is not as good as someone else’s or even our own ideal, we need to be pleased when we do our best. Of course we can always look to improve, but we shouldn’t let good, honest work get in the way of satisfaction. A few months ago, I ran a 5K with a friend. She ran really well. She was 10 seconds shy of her goal time, but she did PR – this after having a baby only a few months before! Instead of enjoying the happiness that would come with a PR and doing better than she had ever done before, she was upset because of that measly 10 seconds. It seems like her frustration robbed her of all joy that should have been hers after months of training. A few minutes after finishing the 5K, everyone noticed one last participant – pushing her way to the finish line. She was in a wheelchair. She was smiling broadly, and pushing herself to the finish line. Everyone who had participated was clapping for her. We were all basking in the best effort of this girl in the wheelchair. My friend and I looked at each other, with the same realization. Here we are, chiding our best efforts, upset…when we have legs! We are capable! We should be happy. We can always seek improvement, but we shouldn’t let true accomplishments be eclipsed by more mountains yet to climb. If I didn’t limit myself I’d eat the whole jar of chocolate hazelnut butter, so yes I guess they are a good thing. But I like the way “No limits” sounds better… btw thanks for following me, I think we’ll find each others posts interesting! GL with your goals!! Hi there…I actually like the word parameters. I want to think of myself as limitless meaning there will always be metaphorical mountains to climb whether running or in my professional life. But with parameters, I am working within a certain frame that lets me respect how much, how far, how long, how hard…and that frame is always changing. If it is one of those weeks where I am burning the candle at both ends, I am for sure going to adjust things. Doing this keeps me going and never, ever think that I need to quit or take a break. It’s about being good to your own self and hearing your body and spirit…Great post btw. I make very short-term goals because I have a very short attention span! Thanks for stopping by my site, hope you enjoy the recipes. Congratulations on taking charge of your health. Really wise discussion here. Thanks, LJay, for bringing our attention to balance! And limits! Of course there are limits, and knowing them is part of the wisdom process! I personally, at 74+, am “maintenance training”, rather than working up to some illustrious goal. As you say, everyone is different! I also am a polio survivor, so I have “givens”… just as a person with a prosthesis has “givens”. That doesn’t put them out of the game. Swimmers mostly race against their personal best, when they are building athletic body-machines. Only Olympians really get to be “best.” And they are only “best” for a time. For the rest of the field of competitors, we will know when we are at the peak, and enjoy it. I can say that the benefits of attaining peak fitness pay back over long years afterward by giving an aging athlete a graceful and kind entry into old age, with way fewer ailments and disabilities than they would if they had been complacent about fitness. I think when setting goals it’s pretty important to recognize the limitations of the rest of your life, such as work, family, and health. Otherwise, you’re going to struggle to meet the goal, or jeopardize other aspects of your life in pursuit of the goal. great topic! I think through setting yourself challenges you find your true limits. It is good to know your limit, but not to be afraid of it. If you know where it is, you can get to it, then push it just a little. Each time you push it you can say “wow, i did better than I ever thought I could”. If you push it heaps however, you might burn out, or get injured etc. So I think both limits and challenges are extremely important. The thing that will decide your results is your attitude toward them. I have a healthy respect for my limits, but I know that they can take frequent small pushes and extensions 😀 I have friends who can run faster and be stronger than me, so I am not going to try and beat them, but use their sucsess as an inspiration that its obviously possible, so if I push just a little more each day, I’ll get there in the end. After watching the Olympics and looking at race times through the decades I truly believe we’re only limited by our imagination. If we had the ability to dream bigger we could achieve more. Jesse Owens was probably capable of times that Usain Bolt is achieving but he couldn’t imagine that he had that ability. I try not to set limits. I’m only limited by what I’m physically able to do right now but that doesn’t mean I can’t achieve so much more in the future. Experience has taught me that when it comes to running, limits are necessary to remain injury-free. In my early years as a marathoner, I’d follow trainning programs that would push the fifty mile per week threshold and run long runs of twenty miles or more on consecutive week and I’d always seem to be battling injury. With age, I cut back on the weekly miles and only did the long runs every other week and would run fresher and more relaxed. My finishing times may have slipped a bit, but that’s not my goal these days. Today I alternate between running, cycling and other aerobic exercises and find it is best for my body. I’m not saying you can run a marathon without doing a significant amount of work, you do. Especially when it comes to doing a long run. But not to the extent that it drains the joy out of what you are trying to achieve. Good luck, you will succeed. I often push myself beyond my limits and burn myself out. However, then I know I CAN do it, which is an amazing feeling! Its a very amazing feeling Holly! Just being able to say “I did it” means the world of difference! I love this subject you have raised to question! Limits and are they healthy for us? This is how I work with this concept / subject: First in order to have limits, one must identify with object. This can be Body, House, Belongings, Status, Personality. Once one has identified himself with and/or as this thing, all his attention dwell upon it. He studies it, inspects it, play with it. What can it do. Then when enough time has passed one will recognize that he is not this. Cause the image / identity breaks! It dies so to speak. An as he perceives it dying he cannot be this ;)! Honestly I am studying the changeless, the eternal – The Self. What I am. This what I am goes beyond death. It claims it Self to be life, love, peace and joy. Everything! Though the simple answer is not enough, only experiencing it, seeing it will satisfy this inquiry. I will not accept limitations for my Self. Cause any limitations will bring some sort of End to it. Something in me, knows this cannot be. This study works with understanding the concepts of: Time, timelessness, perfection, Love and Fear. Creation and Creator. Forgiveness, holiness, Death. What I am – Spirit. Communication, eternity. Mind. Oneness.Body. I say its like one speaking to your Self, directly and AS your Self! I once read a quote (I don’t know who wrote it): For every success, a thousand failures forgotten lie. For every failure to try, a thousand successes may prematurely die. Ever since I read this, I have stopped setting any limits for myself. I know that I can always try to achieve something because it’s better to have tried and missed out than to not try at all. That doesn’t mean I do silly things though – I still know what is safely within my ability and what isn’t. But I also don’t set limits to stop me from trying anything. For example, I have decided I want to be an ultra marathon runner. I want to run 100 milers. So, instead of spending a year training and perfecting my running / fitness, I entered a 50km trail race that was only 2 weeks away at the time. I decided that I would simply walk as much as I needed to and would accept that there was a strong possibility that I could come last. I also took the early start option to give myself the best chance of finishing within the cut-off time. I succeeded. Two weeks later (last week) I won an entry into a marathon, which is being held on 26 August. I accepted the entry and then decided that seeings I will have done an ultra and a marathon each in July and August, and have entered 50km trail runs in both September and October, I might as well try to run 1 marathon or ultra a month for 12 months. It’s crazy because I’m not someone who runs lots of miles or anything like that. In fact, up to May this year, I had been a sprint distance triathlete for 12 months and a couch-potato for 5 years prior. But I don’t want to limit my dreams or goals. I know that I cannot just turn up to run a 100 miler. But I know that I can turn up every month and plod out a marathon or 50km event at the back of the field. Rather than limiting myself to running a marathon after I have trained sufficiently to do it comfortably or quickly, I am taking a chance that I might fail … And I am accepting that when I succeed (because I will succeed), I will be running at the back of the field. But that’s still better than sitting on the couch wishing I was fit enough to try. Not sure whether that makes sense. But it’s my thoughts on limits. Personally, I am lucky to be surrounded by people who encourage me to push my limits and give crazy goals a go. I’m getting a reputation at my running club for being a bit mad … but no one ever tells me that I won’t be able to do what I set out to achieve. I think it’s all about finding a balance. One thing I’ve learned from my running career is to dream big and ask myself ‘why not?’ Why can’t I break a 6:00 minute mile? Why can’t I be the one to win the race? Usually I can’t come to find a good answer to these questions. If I work hard and stay determined, there is no reason why I can’t achieve my goals. But, like you mentioned in your post, many athletes get injured because they do not listen to their bodies. I owe my stress fractured femur, plantar fasciitus, and runner’s knee to trying to keep up with others when my body was not physically ready to do so. In the end having a go-getter attitude is a good thing, you just have to be smart about it and not forget to listen to your body. tell me how is the fearless mind aware of any limits? for me, the way that i live and the way that i have grown up, i have never know fear, just an excitement of sorts when i am faced with a challenging situation. Limits limit growth. And growth should never be limited or inhibited. great post. its true that challenging yourself to do more takes time to build up to the next level. this is where you build strength and endurance, and can go to the next level. your body almost asks you to do more….listening to it can take you all the way to the next level. Thanks for the motivation! Thank you everyone for all the great and detailed comments. I am glad that you liked the topic and keep inspiring others. We cant change the world but we can do our best trying!! Have a great week! This is a great post! I’ve been pushing myself harder and harder these past couple of months, because I’m doing a month long indian cycling tour, I want to be able to enjoy the scenery and not feel like I’m going to die, but I don’t know what I’m going to do after the tour. Its only in a years time, but I want to be prepared! Respecting your physical or mental limits are important. That doesn’t mean to say that you should not try for hard goals, but it does mean we need to be honest about where we are and if the goal is realistic. As I train for my second half-marathon, I wonder if I was a little unrealistic in setting this goal for myself based upon my current physical condition. I think setting challenging goals helps determines where your limits are and pushing your limits makes you stronger. I’ve been pushing my limits at the gym lately and it’s motivating and reminding why I’m doing it. I don’t like the term limits, in constructive training you need a good plan. That plan creates a structure that will help obtain your objective. So by design you have created steps (limits) to safely and effectively progress. How much is enough? I agree with others that enough is a feeling not an achievement. Great post though! Ill be folllowing. I try to teach my patients and clients that limits are in flux and always changing. For example, I had a patient that was suffering from severe fatigue and depression. She was 20lbs over weight and exercising 5-6x week at a high intensity. I had to teach her that she had a specific limit/tolerance for exercise due to her physical health. We worked together over the course of 6 months where she was only working out 2-3x week, but focusing on cleaning up her nutrition and really focusing on stress management skills. She lost 25lbs effortlessly and was shocked when she went back to her old exercise intensity, which was limiting her health, to find that it was easy and now a aiding her health. It doesn’t have to be health related only. People may feel limited by thier relationships, jobs, or even education. In reality the limiting factors can change. WOW this is awesome that you were able to help your patient accomplish major goals and turn her thinking around. Youre right, sometimes we over do things which only makes it worst is some cases. Thank you for sharing, this is really inspriting! Great post with lots of great comments! I agree with the happiness factor. More is not always better. Let’s take running for example: You can always run a 5k faster. The running progression does not have to be 5k then 10k then full marathon. If running a marathon truly makes you happy then go for it but remember just because a little is good, a LOT is not always better”. Limits…I know they are important but it is difficult for me at times. The section of the gym that I work out is not a common place for a woman to be, let alone an extremely obese woman. On that section of the gym you will mostly find body builders, wrestlers and police officers…..and me. Ha ha. They are very kind, helpful and supportive but working out around those guys can fog my limits. I have to really focus and listen to my body. Injuries happen easily for me…i am very strong but still have 93 pounds to lose off this body so I have to learn and practice motification and limits. It is extremely hard for me to accomplish, but if I don’t I will get injured and then have to slow my progress which means my targeted goals aren’t met. Thanks for listening. i will visit longer when time allows. Thank you for sharing your story! Good luck on your weight loss goal. Be patient, stay confident, and motivated!! 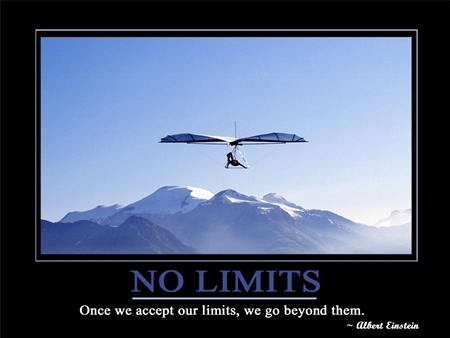 You are so right about limits and that everyone has their own.Love this post..very inspiring. Perhaps along the same line as whether or not to set limits, is setting realistic goals. I think when we start with realistic goals, it is tempting to keep stretching and pushing those goals. Each time we meet a goal, it is reinforcement and we feel energized and capable of reaching another goal. There’s nothing wrong with that, as long as we create a balanced life in between those goals. If a person is spending all their time on fitness, or on work, or on parenthood, they lose the everyday beauty of living. That’s a big loss. I am one of those ultra runners who some would say have an issue with limits. However, I try to look at more as I understand my limits. I am planning to run a 100 mile race next year. I have already completed a 50 mile race. My goals though fit my current lifestyle. I completed my MBA last year, I work a regular 9-5 (really 6:45-4), my fience and I do not have kids. What I am getting at is, in my current situation i have a chance to attempt something epic for myself. I understand that this oppurtunity may not be here in 5 years and I want to make the most of it. As far as other physical limiitations, I know i cannot run a sub 5 min mile. And i just want to find out if I can run a sub 24 hour 100 miler, as long as I can do it without throwing my life out of balance. Congrats on your MBA. Hope to complete mine soon!! I agree. Finding the right balance between pushing personal limits and staying happy, healthy, and relaxed – that is the key for me. I actually just wrote a post about that with regard to my running. Great minds think I like. All about balance. I agree 100% with the need to check your goals against your happiness quotient. While I also strive for balance, in general, I find that the older I get what might be considered “balance” actually skews to more sedentary pursuits. Thus, in the Spirit of Jack Lalane and a few other health heros, I have pushed myself more and tried to stay just to the active/healthy side of balance. Great post. Great post from L-Jay Health!